This Fuel Shut Off Solenoid for Cummins C & B, 5.9L & 8.3L engines with Bosch P7100 pump, has 2.5" mounting bolt spacing, center to center, heim joint for the rod end and 3 round pins connectors. Perfect fit, direct replacement for use on many Ford, Freightliner, Motorhome and Marine applications. Please verify that you have 2.5" spacing, center to center, on your two mounting bolts. This is a new solenoid. high quality aftermarket In Stock Item !! 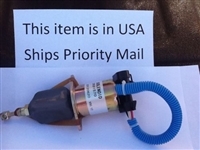 Brand new fuel shutoff solenoid for Cummins B&C 5.9L & 8.3L engines with Bosch P7100 pump.Used on many Ford Freightliner Motorhome and Marine applications. This solenoid does not fit the Dodge Cummins pickup because this has the round pin connectors. Brand new fuel shutoff solenoid for Cummins B&C 5.9L & 8.3L engines with Bosch P7100 pump. Used on many Ford Freightliner Motorhome and Marine applications. This solenoid does not fit the Dodge Cummins pickup because this has the round pin connectors. It has 3" bolt spacing and uses a heim joint rod end.